Have you been thinking about adding a pet to your family - a cute little kitten or perhaps an older feline friend to keep you company these cold winter nights? The Australian Animal Protection Society are halving their normal adoption fees on Saturday 3rd June 2017 to help make that dream a reality. The sad fact is far too many animals end up in rescue shelters. Unwanted or unable to be kept for any number of reasons, the shelters are then charged with the task of helping find homes for these little souls who just want somebody to love. Adopting a pet is a big responsibility and not a choice anyone should make lightly, but if you are able to offer a cat or kitten from the rescue shelter a forever home then this is a fantastic opportunity. 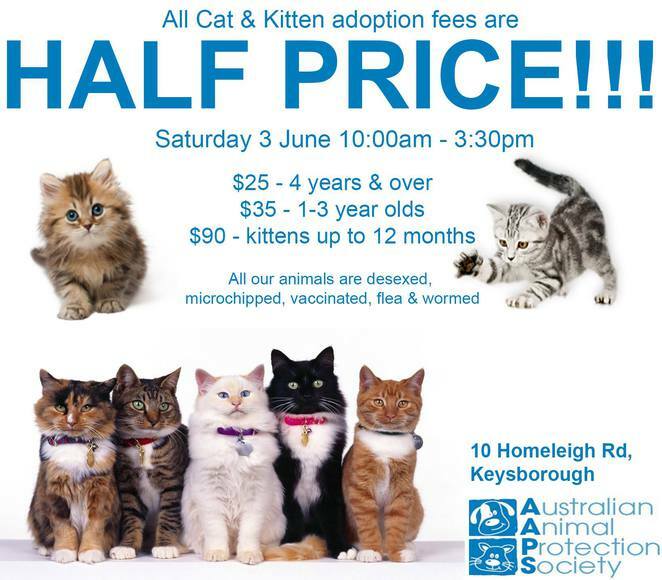 All animals adopted from the Australian Animal Protection Society are desexed, vaccinated, microchipped, flea and wormed, and on Saturday 3rd June 2017 adoption prices are being halved. Cats aged 4 years and over will be only $25, cats aged 1 to 3 years will be $35 and kittens aged up to 12 months will be $90. Many animal profiles are posted on the AAPS website, which you will find by following the link here. At the moment there are over 50 cats featured so take your time browsing some of the animals currently housed at the shelter before going in to meet them in person. The shelter also offers a selection of dogs, as well as small animals such as guinea pigs and rabbits. The AAPS is always in need of support, so even if you can't adopt a pet you can still help. Donations can be made through the website. The Australian Animal Protection Society is located at 10 Homeleigh Road, Keysborough and is open 10am to 3.30pm daily, except Sunday when the shelter is open 11am to 3pm.